Users in heavy industries have a new motor control option for compressors, pumps and fans. 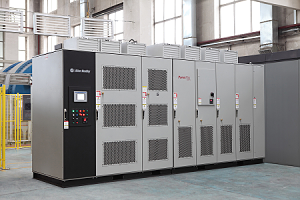 Allen-Bradley PowerFlex 6000 medium-voltage AC drives from Rockwell Automation offer expanded, user-friendly control for variable and constant torque applications. The latest release delivers a wider voltage range (2.4 to 11 kV) and provides 100 percent starting torque, leveraging sensor-less vector control. The PowerFlex 6000 drive is easy to commission, use and maintain, with standard faceplates and EtherNet/IP connectivity. The drive is a cost-effective solution for heavy industries with higher power needs for their applications. With an extended power range, the drive can be used for applications with output-voltage ratings up to 11 kV and motor current ratings up to 680 A, while remaining an air-cooled design. With eco-designed main cooling fans, users in Europe and other IEC-based markets can meet EC regulation 327 and ErP directive 2009, and avoid the larger footprint of a liquid-cooled drive. Internally powered cooling fans reduce customer-supplied control power requirements, and equipment and installation costs. A tertiary winding on the isolation transformer provides internal power for the fans. Two new output-voltage ratings are available – 6.9 kV for North America, and 11 kV for EMEA and Australia. The full range of ratings includes 2.4, 3, 3.3, 4.16, 6, 6.3, 6.6, 6.9, 10 and 11 kV. With optional, automatic cell bypass up to 680 A, users can keep their operations running in case of a power cell failure and reduce unplanned downtime. In addition, an uninterruptible power supply helps increase system reliability, minimise downtime and mitigate potential machine damage. Allen-Bradley, LISTEN. THINK. SOLVE. and PowerFlex are trademarks of Rockwell Automation Inc.